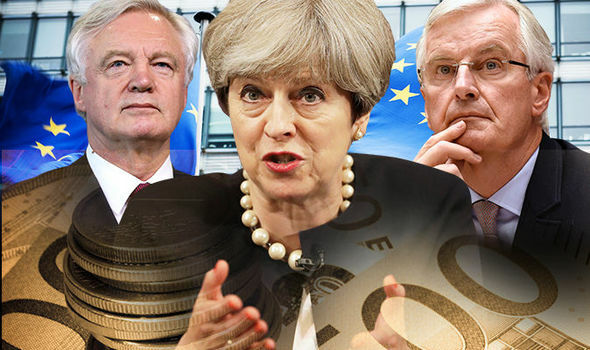 THERESA May will attempt to break the stalemate in Brexit talks by handing Brussels £27bn in return for a 'status quo' transition deal after leaving the EU, it has been claimed. But EU negotiators are stlll expected to demand a severance payment, of at least some £52bn as part of the so-called divorce bill. Mrs May is set to use her speech in Florence next week to outline her plans for an interim arrangement that will keep the UK tied to the bloc for two or three years after 2019. Britain's Brexit team are keen to start talking trade deals with their EU counterparts, but chief negotiator Michel Barnier has stood firm, refusing to discuss future arrangements until the Brexit divorce bill is trashed out. Whitehall hopes the offer of payments during a transitional period would appease Eurocrats, by plugging a £26bn budget hole left by Brexit. Chancellor Philip Hammond has already said any transitional deal with the EU would look "much like the status quo" while businesses get their bearings after Brexit. And Brexit chief negotiator has also admitted he is looking for a phasing out period that is "as close as possible to the current circumstances". That would mean continued access to the single market and, presumably, free movement of people. But as a non-EU member, Britain can expect to have to pay for access to the single market and the customs union. A senior EU official told the Financial Times: "Obviously should there be transition... there is a contribution to make for that single market participation which is independent and on top of any debts from the past." According to its latest forecasts, the Office for Budgetary Responsibility predicts the UK will continue to face the same budgetary costs as if it were still in the EU. Britain could pay £26bn to the EU, and keep the "status quo" without having to push up borrowing. Lord Bridges, a former Brexit minister, said Britain would then be "honouring commitments" made to the EU pre-Brexit and make it harder for Brussels to demand more for leaving. "The EU would then need to justify why we must contribute more than that," he said. Former deputy prime minister and outspoken Remainer Nick Clegg said: "Theresa May should use her Florence speech to admit something that everybody in Whitehall already knows: the government has set aside £27bn of payments to the EU in this Parliament after we leave. "She should deploy this unused reserve, buried in the OBR's own figures, to unblock the Brexit talks. "EU negotiators can read the OBR documents as well as anyone else." Express.co.uk has contacted Number 10 for comment.